According to a study published today in the journal Scientific Reports, higher temperatures and less precipitation have reduced waterbird habitat, resulting in fewer birds in the region and elsewhere. The study, which began in the mid-1990s, is the result of a research collaboration between scientists at Oregon State University, U.S. Geological Survey, University of California, Merced; and the Alliance for Global Water Adaptation. The researchers examined more than a century's worth of temperature and precipitation data across the Great Basin, which spans nearly all of Nevada, much of Oregon and Utah, and portions of California, Idaho and Wyoming. They compared the data with more than 50 years of results from the U.S. Geological Survey Breeding Bird Surveys, which began in 1968. The research focused on waterbirds, which are species that include shorebirds, ducks, geese, swans, herons and rails. The Great Basin is a major part of the Pacific Flyway, a major north-south route for migratory birds in North America. During spring migration, more than 2 million waterfowl pass through the southern Oregon-northeastern California region of the Pacific Flyway. "We examined a broad timeline and took an extensive geographic view to determine how the Pacific Flyway might have been altered as a result of changing climates," said study lead author Susan Haig, senior scientist emerita with the U.S. Geological Survey and professor of wildlife ecology in the Department of Fisheries and Wildlife in OSU's College of Agricultural Sciences. "We found reasons to be concerned that changing water conditions might seriously impact the viability of the flyway as a whole," Haig said. The group found significantly higher temperatures and lower amounts of precipitation in the region during at least the past 20 years. 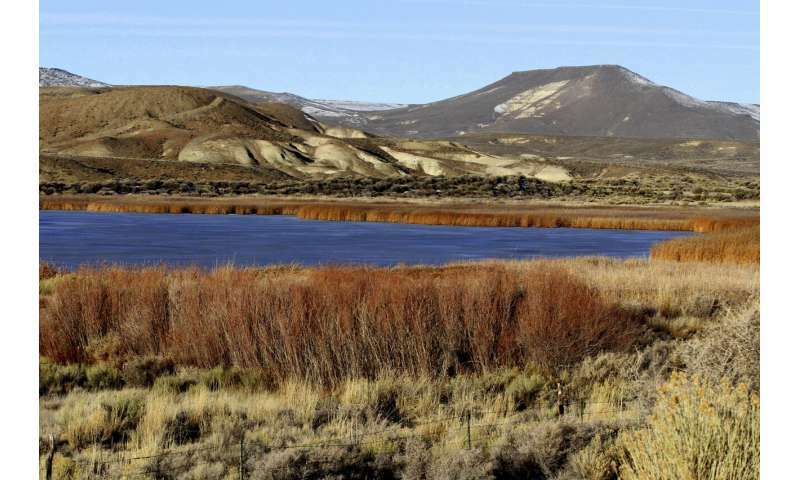 The result was less spring snowmelt flowing into Great Basin wetlands. The water arrived earlier and was present for a shorter period of time, reducing the amount of appropriate habitat at the right time for migrating and breeding waterbirds. In addition to lack of snowmelt, summers in the Great Basin are growing hotter, drier and longer. Summer arrives earlier and leads to less surface water. In this study, the researchers found that mean annual minimum air temperatures increased in the Great Basin from 1900-2008, but significantly increased from 1980-2008, with the greatest increase occurring during the summers. Precipitation changed only marginally from 1900-2008, but from 1980-2008 the majority of the region became drier. "These are silent changes, not dramatic from one year to the next," said study co-author Ivan Arismendi, an assistant professor in the OSU Department of Fisheries and Wildlife. "It's clear the whole ecosystem has changed in the last 35 to 40 years. These changes are small but consistent and important. They cause changes in the whole community, not just one species." Warmer temperatures can make wetlands saltier or even cause them to evaporate. Salty water is a serious stressor for young waterbirds because their salt glands are not yet developed. "If waterbird parents are not near freshwater when chicks hatch, they will march the brood across the hot desert in search of it." Haig said. "The results are never good. Taken across many species, this situation could be disastrous for waterbird populations in the region." The researchers found significant associations between climate and bird abundances. With higher temperatures and less precipitation, fewer birds were observed annually in 11 of the 14 species studied across more than 50 years. "Without careful planning, waterbird species breeding in the Great Basin will continue to be stressed by unchecked climate shifts," said study co-author Sean Murphy, a former wildlife ecologist with the U.S. Geological Survey and now the state ornithologist for the Pennsylvania Game Commission. Prior research had determined a 70 percent decline in shorebird populations since 1973, and more than half of the nine most important western salt lakes for birds have diminished by 50 to 95 percent over the past 150 years. "We need to manage for water quality and water quantity on individual wetlands and as a flyway to insure their viability to millions of birds throughout the year,"said study co-author Mohammad Safeeq, research scientist at the Sierra Nevada Research Institute, University of California, Merced. Study co-author John H. Matthews, with the Alliance for Global Water Adaptation, said, "Migrating, breeding, developing and post-breeding birds need water, but they also need good quality water. This is one of the first studies to show that climate change is altering water quality. If shifts in climate can alter water quality for birds, then climate change can alter our water quality too. These bird populations are the canary in the coal mine for all of us."